Artist Antonia Pérez creates sculptures by weaving discarded plastic bags. She worked at the gallery during the exhibition. This is the final weekend for the exhibition “Lettuce, Artichokes, Red Beets, Mangoes, Broccoli, Honey and Nutmeg: The Essex Street Market as Collaborator” at Cuchifritos Gallery located in the Essex Street Market. The exhibition curated by Nicolás Dumit Estévez Raful has been in the works for the past two years. 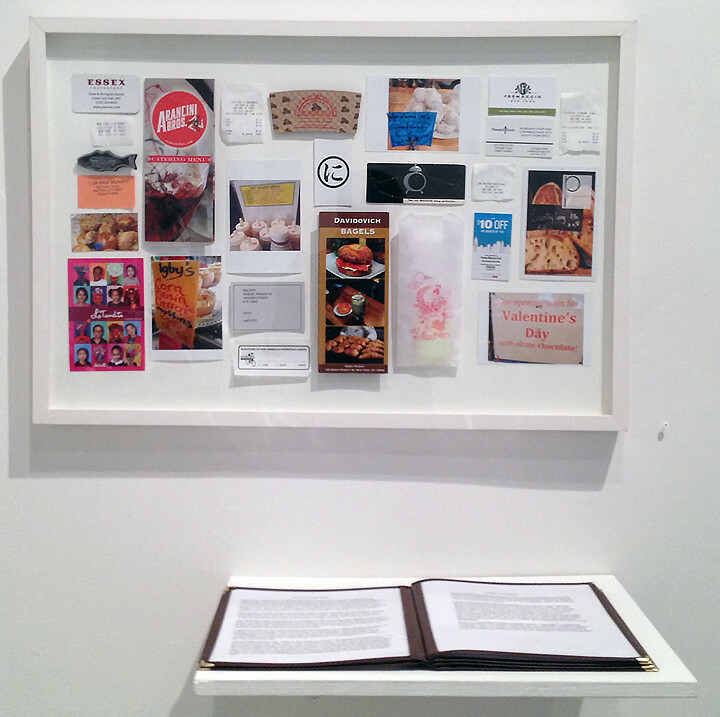 The premise of the exhibition is for “six socially conscious artists to engage vendors, customers and the Market itself in their artistic processes as a means of co-generating experiences centered on the life that unfolds outside Cuchifritos Gallery, the art space of the Artist Alliance Inc”. So in preparation for the exhibition, the artists came together with Jodi Waynberg the Executive Director of Artist Alliance as well as Nicolas to begin considering how the artists might work with the market. Jodi toured the artists through the market and introduced them to various vendors as well as the building manager and staff. Nearly all the artists attended a Vendors Association Meeting to present their projects and solicit collaboration. 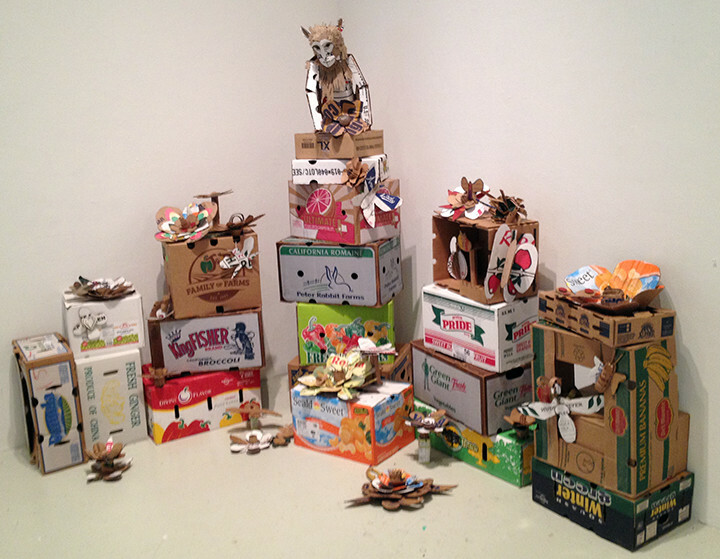 “Refuse Redo” a collaboration between Mary Ting and Lower East Side Girls Club/La Tiendita – sculptures made from market cardboard. As one may imagine, the vendors are small business owners and workers. The market is the place that they go to for employment, not necessarily for cultural engagement. Many of the vendors are entirely preoccupied with maintaining their business and were no nonsense about artistic participation. If the artists did not approach with a brief and concrete plan for collaboration, there was little chance of any cooperation. A few vendors were excited at the prospect of creative engagement and happily collaborated. However in general, the ambitious projects envisioned by the artists needed to be simplified. 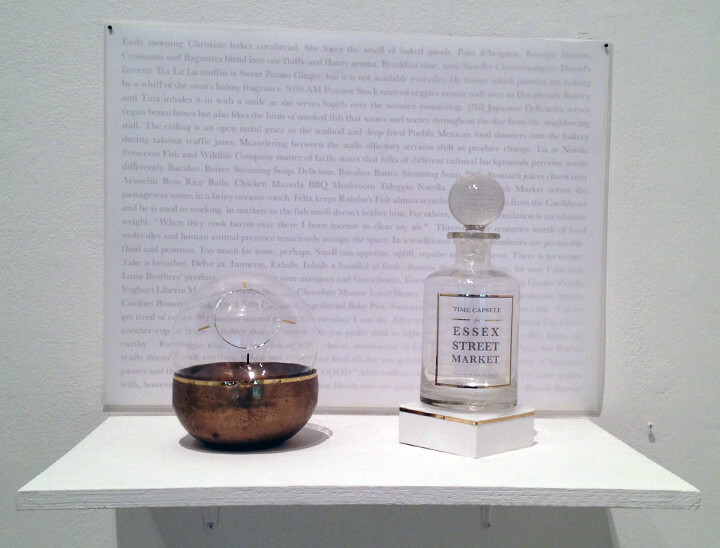 Scent and air time capsule of the Essex Street Market by Beatrice Glow. Market collection and journal by Inspector Collector Harley Spiller. Laia Solé and Nicolás Dumit Estévez Raful employ the color green from the market to create a video montage that collapses the artists at work and the market at work. For example, I wanted to create an audio montage of the vendors chanting or singing their goods and then to have that audio amplified onto the street via a bullhorn installed on the facade of the Essex Street Market. The concept was to have the interior of the market spill out onto the street as street markets commonly do in Latin America and Europe. Most of the vendors were not comfortable in singing their goods and the building management did not allow the installation of the bullhorn due to city ordinances regarding noise pollution (at least that was their excuse). When I was recording one of the vendors, a shopper approached me to tell me about recipes that she uses for a particular root. It then occurred to me that if vendors did not want to sing, perhaps they would share a recipe and the audio montage became primarily recordings of market recipes. 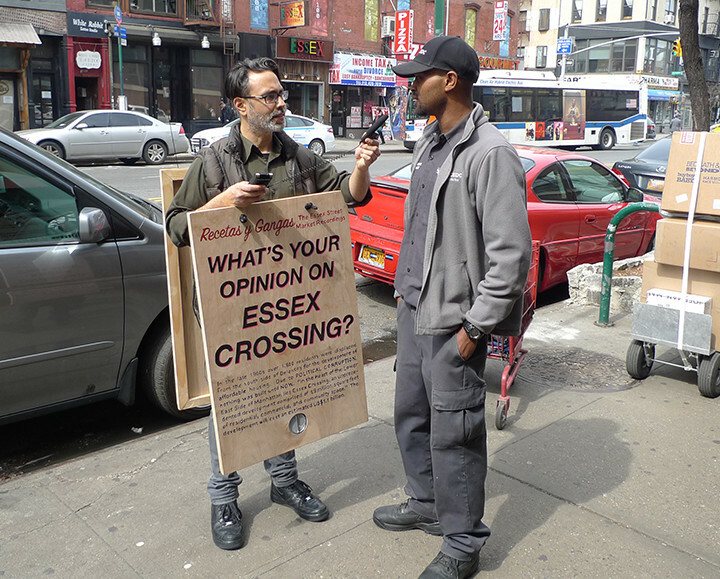 As the piece would not be projected onto the street via a loudspeaker, I created a sandwich board with a speaker installed into it and wore the sandwich board on the street. In this way, the original concept of the piece was fully realized. 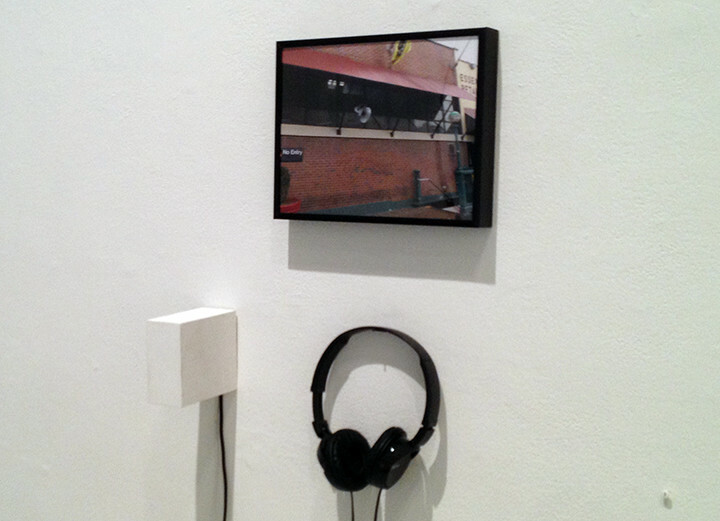 Each artist has her or his own story of how the work needed to be modified for the final exhibition. And in the end, this is the nature of collaboration.